White flowers, VII–VIII; bright green foliage; broad spreading habit; height 26–30cm; spread 46–60cm. Named after the master draper of Dundee, the grandfather of the introducer. Flowers few, mauve; foliage light green, with pink tips in spring lasting well into the summer; habit low, compact. Seedling, raised by Stan Crabtree, Eversley Nursery, Hesketh Bank, near Preston, Lancashire; named after his grand-daughter. ❁ Shell-pink (H16) flowers, VIII–X; bright green foliage; height 21–25cmr; bushy, compact habit; spread 31–45cm. Best double pink where a compact plant is required. Wild-collected; found in Radnor Forest near Presteigne, Wales, by Miss H. M. Appleby in 1954; introduced by Dingle Hollow Nursery (Stockport, Cheshire, England) about 1955. Named after the place where it was collected. ❁ Shell-pink (H16) flowers, VIII–IX; light gold foliage in spring and summer, turning greener in winter; bushy, compact habit; height 21–25cm; spread 31–45cm. White flowers, VIII–IX, in long spikes; mid-green foliage; broad, vigorous, upright habit; height 46–60cm; spread 46–60cm. Lilac-pink (H11) flowers, VIII–X, floriferous; dark green foliage; vigorous; height 46–60cm; spread 46–60cm. Named after the husband of Elsie Purnell. Lilac-pink (H11) flowers, VIII–X; bright, light green foliage; vigorous; height 46–60cm; spread 46–60cm. Except for foliage colour, similar to 'Ralph Purnell'. 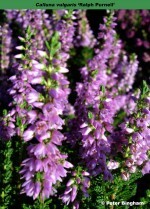 Pale purple flowers, VIII–IX; dark green foliage; vigorous, upright; height 46–60cm; spread 46–60cm. A sport from 'Ralph's Red'; introduced by J. D. W. E. van der Lip (Hazerswoude, Netherlands) in 1991. Name is alluding to the parent cultivar. 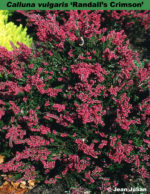 Deep purple-red flowers, VIII–IX; dark green foliage; upright; height 46–60cm; spread 61–75cm. Sport on 'Ralph Purnell'; found and introduced by J. D. W. E. van der Lip (Hazerswoude, Netherlands) in 1989. Name alludes to the parent cultivar. Deep crimson (H13) flowers, darker than 'Darkness', VIII–IX, in dense spikes; dark green foliage; low spreading habit; height 31–45cm; spread 46–60cm. A seedling found by Mr & Mrs Randall (Dunchideock, Devon) in 1981, growing near 'Darkness'. Mauve (H2) flowers, VIII–IX; yellow-bronze foliage, the young shoots with coral-coloured tips; compact habit; height 16–20cm; spread 26–30cm. Lilac-pink (H11) flowers, on reddish stems, VIII–IX; dark green foliage, the new shoots tipped orange and red; height 26–30cm; spread 46–60cm. Named after Rebecca Okell, daughter of the nursery-owner. ♤ Bud-flowerer, dark red; IX-XII; Habit bushy, upright; height 50cm after 5 years; spread 50cm. "Darker than 'Angie'." Sport on 'Angie', found by Johannes van Leuven in September 2007. ® C.2009:08 registered on 27 November 2009 by Johannes van Leuven, Geldem-Liillingen, Germany. ❁ Flowers “double” in dense, long “spikes”, deep cerise red; VIII-X; foliage dark green; habit upright heather with erect shoot;. Similar to ‘Dark Beauty’ but with lighter green foliage and redder flowers. Mauve (H2) flowers, VIII–IX; gold foliage in summer, changing to intense orange-red in winter; semi-prostrate; height 16–20cm; spread 31–45cm. A distinct improvement on 'Golden Carpet' and 'John F. Letts' for winter colour. Raised by A. Taylor (Crowborough, Sussex, England); introduced by Denbeigh Heather Nurseries (Creeting St Mary, Ipswich, Suffolk) in 1975. ❁ Crimson (H13) flowers, VIII–IX; dark green foliage; broad spreading habit; height 16–20cm; spread 61–75cm. A sport from 'J. H. Hamilton' found in Germany: the name is German and should not be altered to Red Favourite. Lilac-pink (H11) flowers, VIII–IX; light to mid-green foliage with brilliant red young shoot tips which persist into summer; upright; height 31–45cm; spread 31–45cm. The young shoots are redder than those of 'Fred J. Chapple'. Seedling, close to 'Fred J. Chapple'; found by J. N. Anderson, Broadhurst Nursery (Grampound, near Truro, Cornwall, England); introduced by J. N. Anderson in 1979. 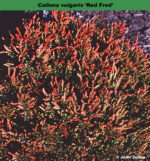 Name alludes to the red young growth, and the parent cultivar. Flowers ruby (H5); VIII-IX; foliage gold; habit erect; height 30cm; spread 45cm. The erect habit helps to make it a striking plant. It was found as a seedling in 1989 in his nursery garden by John Proudfoot of Methven. Perthshire. Lavender (H3) flowers, VIII–IX; dull gold foliage in summer. turning reddish bronze in winter; height 46–60cm; spread 61–75cm. History uncertain: introduced by Ronald E. Hardwick (Newick, Sussex, England) in 1968, or introduced by J. W. Sparkes (Beechwood Nursery, Beoley, Redditch, Worcestershire). Name is an allusion to the winter foliage colour. Mauve (H2) flowers, VII–VIII; bronze-yellow foliage, changing to bronze-red in winter; vigorous, upright; height 31–45cm; spread 46–60cm. Found by J. Dekker (Mijdrecht, Netherlands); introduced by P. G. Zwijnenburg (Boskoop, Netherlands) in 1975. Named after the finder's dog (see also Calluna vulgaris 'Golden Max' and 'Orange Max'). Crimson (H13) flowers, VIII–XI; dark green foliage; height 16–20cm; spread 31–45cm. Found by P. Bakhuyzen & Zonen (Boskoop, Netherlands); introduced by Bakhuyzen in 1981. Flowers deep red; IX-X; foliage dark green; habit semi-prostrate. From Ripkens Nursery, Niederrhein, Germany, before 1991. Pink flowers, VIII–X, abundant; dark green foliage, young shoots tipped red in spring; prostrate; height 10–15cm; spread 31–45cm. Found on Trink Hill, Cornwall. ❁ Cerise (H6) flowers, IX–X, redder than 'Annemarie'; dark green foliage; open habit; height 31–45cm; spread 46–60cm. Outstanding. Sport on 'Annemarie', deliberately induced by irradiation; found by Kurt Kramer (Edewecht-Süddorf, Germany); introduced by Kramer in 1984. Crimson (H13) flowers, VII–IX; dark green foliage; upright; height 31–45cm; spread 46–60cm. Introduced by Bill Goddard (Flora Vista, British Columbia, Canada) before 1978. Name alludes to the flower colour -- but perhaps more correctly to the spring growth being red. ♤ Beetroot (H9) buds IX–XI; dark green foliage; broad, somewhat spreading and open habit; height 21–25cm; spread 31–45cm. Redder than 'Marleen', but less so than 'Alexandra'. Sport on 'Marleen'; introduced by H. Hoekert (Oldebroek, Netherland) by 1988. Name alludes to the flower form and colour. 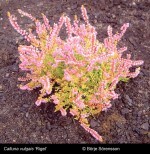 This name was also used as a synonym for Calluna vulgaris 'Rose Bud'. Kramer (15 June 1997 ms) listed it also as a synonym for 'Marlies'. 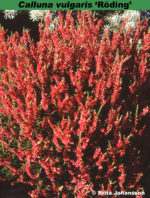 Purple-red flowers, VIII–IX, in long spikes; yellow-orange foliage, turning orange-red in winter; open, spreading, somewhat creeping habit; height 21–25cm; spread 31–45cm. Found by J. Proudfoot (Almondell Nursery, Methven, Perthshire, Scotland). White flowers, VIII–IX, in longe spikes; downy grey foliage, young shoots with yellow tips in spring and summer; very erect; height 31–45cm; spread 46–60cm. One of the best "spring-tip" lings. Seedling; found by T. Huisman (Hattem, Netherlands) by 1980 and introduced in 1986 by H. W. de Bruijn (Boskoop, Netherlands). Named after the introducer's wife. ♤ Flower buds H8, IX-XII; foliage mid-green; habit upright; height 30cm; spread 25cm after 3 years. Sport on 'Hera', found by Kurt Kramer in October 2007. ® C.2014.06: registered on 11 September 2014 by Kurt Kramer, Edewecht-Süddorf, Germany. ♤ Bud-flowering: pink (H8), buds small to medium sized: IX-XII; habit moderately robust; height 25cm; spread 30cm. Sport on ‘Vivian’ found by Kurt Kramer in 2007. ® C.2010:03 registered on 14 June 2010 by Kurt Kramer, Edewecht, Germany. Mauve (H2) flowers, VII–IX. profuse; pale green foliage; prostrate; height 10–15cm; spread 26–30cm. Seedling found by F. Kircher (Heideberg, Hamburg-Langerhorn, Germany) in 1968; introduced by F. Kircher in 1972. Name is a shortened form of Erica. Lavender (H3) flowers, VIII–X; orange foliage in summer turning red in winter; erect; height 31–45cm; spread 46–60cm. Introduced by Pennyacre Nursery (Springfield, Fife, Scotland) by 1977. Pale mauve flowers, VII–IX; light green foliage, young shoots tipped bright yellow in spring; broad upright habit; height 31–45cm; spread 31–45cm. It arose as a seedling with Mr T. Huisman of Hattem, and was introduced by Mr H. W. de Bruijn Boskoop in 1992. This cultivar won a silver medal at Floriade 1992. Flowers pale mauve (H2), single, VIII-IX; foliage rich golden in Summer, light red in Spring; there are red tints in the foliage even in Summer; habit low, spreading, to 20cm tall, 45cm across after 5 years. Seedling, deliberately raised in 1998 and selected by Brita Johansson. ® C.2005:03 registered on 25 August 2005 by Brita Johansson, Musselvagen 3, 468 34 Vargon, Sweden. Pale mauve (H2) flowers, VIII–IX; dark green foliage with occasional orange-yellow shoots; height 16–20cm; spread 31–45cm. Wild-collected sport; found on a plant in a quarry at Rivington Pike near Bolton, Lancashire, England, by Jack Platt (Ulnes Walton, Lancashire) in 1978; introduced by Felsburg Nursery in 1981. Lavender (H3) flowers, VIII–IX; downy, soft yellow foliage, becoming duller with red tints in winter; upright; height 31–45cm; spread 46–60cm. Seedling near 'Silver Knight'; found by H. M. J. Blum (Steinwijkerwold, Netherlands) in 1980; introduced by P. G. Zwijnenburg (Boskoop, Netherland) in 1983. Fantasy name, alluding to parent cultivar. Lavender (H3) flowers, VIII–X; gold foliage in summer, turning orange in autumn, and red in winter and spring; rounded compact habit; height 21–25cm; spread 61–75cm. Prone to disease. Found by J. W. Sparkes (Beechwood Nursery, Beoley, Redditch, Worcestershire, England); introduced by J. W. Sparkes by 1962. Named after the eldest child of Charles Chapman, Birmingham, England. Dark crimson flowers, VII–VIII; dark green foliage; compact; height 31–45cm; spread 46–60cm. Named after the nursery in USA which introduced it. Crimson flowers, IX–X; mid-green foliage; upright. An un-named plant (which had been imported from Denmark) purchased about 1980 in a flower-shop at Vargön by Mrs Brita Johansson (Vargön, Sweden); named by Mrs Johansson by 1995 and introduced in 1995 by Henry Olofsson (Ödsby Nursery, Munkedal, Sweden). Name is the Swedish word röding means "something red", an allusion to the flower colour. It is also the name for a fish related to salmon. ❁ Ruby (H5) flowers with white centres; IX–X; foliage grey–green; habit broad, upright. A sport from 'H. E. Beale' found by J. Hachmann (Barmstedt, Schleswig-Holstein, Germany) by 2000. Mauve (H2) flowers, VIII–IX; golden-yellow foliage in summer, turning bright orange in winter, the shoot-tips a deeper colour; height 10–15cm; spread 31–45cm. Recommended. A sport on a wild plant found near Carrick-on-Suir, County Waterford, Ireland, by Rinus Zwijnenburg (Boskoop, Netherlands) in 1970; introduced by P. G. Zwijnenburg, Boskoop, in 1972. Named after a friend of Rinus Zwijnenburg [Ericultura 60: 17 (1986)] who was on holiday with Zwijnenburg in Ireland when the sport was found. Deep lilac-pink (H11) flowers, VIII–X; mid-green foliage; neat habit; height 16–20cm; spread 31–45cm. Similar to 'Mullion'. Named after E. Hoare's wife. ♤ Purplish red buds, VIII–XI, abundant; hairy, dark green foliage; broad, erect habit; height 31–45cm; spread 46–60cm. Seedling; raised by Kurt Kramer (Edewecht-Süddorf, Germany) in 1984; introduced in 1990; submitted for plant breeders' rights on 28 September 1989; rights granted on 20 February 1992. Fantasy name. Preliminary designation (vorläufige Bezeichnung; Anmeldename) was 'Knospenbluher rot'. Prostrate; yellow foliage in spring and summer turning orange-bronze in winter; height 10–15cm; spread 26–30cm; flowers not produced. Wild-collected; found in the Shetlands by John Copeland; introduced by Jack Drake (Inshriach Nursery, Aviemore, Inverness-shire, Scotland) in 1985. Named after the locality where it was found on Mainland, Shetland. ♤ Lilac buds, IX–XI; dark green foliage with a reddish tinge; height 31–45cm; spread 46–60cm. Sport on 'Underwoodii'; found by P. Bakhuyzen & Zonen (Boskoop, Netherlands); introduced by Bakhuyzen in 1979. Name is a reference to the young growth in spring. Pale lavender (H3) flowers, VIII–IX; green-yellow foliage with an occasional red shoot; loose open habit; height 31–45cm; spread 46–60cm. Not as good as 'Rosalind, Underwood's'. Found by Mrs A. M. Wye (Crastock Heath, Woking, Surrey, England); introduced as C. vulgaris 'Rosalind' by Crastock Heath Nurseries in 1961. Named originally, perhaps, after Mrs Wye; later the name of the place where it was found was added. Lavender (H3) flowers, IX–X; yellow-green foliage in summer, with yellow shoot-tips in autumn, winter, and spring; height 26–30cm; spread 46–60cm. Outstanding. Introduced by G. Underwood (Hookstone Green Nursery, West End, Woking, Surrey, England) by 1948 as Erica vulgaris 'Rosalind'. Rosalind has not been identified; later the name of the nursery where it was found was added. ♤ Bud-bloomer; rose-pink; VIII-X; foliage bright green; habit broad, upright. Sport on 'Klaudine', found by Kurt Kramer in 2000. Registered on 8 July 2003 by Kurt Kramer. ♤ Dark red buds, VIII–XII; mid-green foliage; spreading; height 30cm; spread 50cm. Sport on 'Alicia', found by Kai Miissig (Miltenberg, Germany) on 4 October 2002 in Miltenberg. "The buds are much darker than 'Pink Alicia'." ® C.2006:01 Registered on 23 January 2006 byKurt Kramer, Edewecht, Germany. Beetroot (H9) flowers, VIII–X; dark green foliage; height 21–25cm; spread 31–45cm. Similar to 'Darkness' but blooms two weeks earlier. 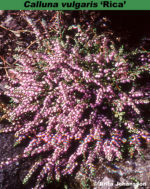 Wild-collected; found on Cluanie Moors near Invergarry, Inverness-shire, Scotland, in 1962; introduced by D. Hutton (Aberfoyle, near Callander, Perthshire, Scotland) by 1973. Named after the introducer's son. ♤ Deep lilac-red buds, IX–I; dark green foliage; broad upright habit; height 31–45cm; spread 46–60cm. ♤ Bud-flowering: dark red; IX-XI; foliage dark green; habit Upright. Outstanding contrast with white-budded, or yellow-foliage bud-flowering cultivars. Sport on 'Aphrodite' found by Frank Mittrach. ® C.2007.01 registered 23 January 2007 by Frank Mittrach, Gorlitz, Germany. Crimson flowers, IX–XI; dark green foliage; upright; height 31–45cm; spread 31–45cm. Selected from seedlings produced by cross-pollinating 'Darkness' and 'Beoley Crimson'; raised in Germany by D. Scholjegerdes (Aschhangerfeld, Germany) before 1987; introduced by Scholjegerdes about 1987. Listed by Heinz Schlangen (Westermoorstr. 33, 26683 Saterland/Scharrel, Germany). Name alludes to the flower colour and month of flowering. Lilac-pink (H11) flowers, VIII–X; green foliage, the young shoots tipped red in spring, turning orange later; strong grower; height 31–45cm; spread 46–60cm. Mauve (H2) flowers, VII–IX; light green foliage; upright; height 31–45cm; spread 46–60cm. White flowers, VIII–X; bright green foliage, the young shoots with yellow tips in spring; height 21–25cm; spread 31–45cm. Outstanding. Wild-collected; found on Calf of Man by F. J. Chapple about 1965; introduced by Slieve Donard Nursery (Newcastle, County Down, Northern Ireland) in 1967. 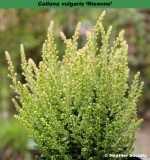 Named after Ruby (1909-1985; nee Rebecca Mills), wife of Leslie S. Slinger, proprietor of the Slieve Donard Nursery (see Calluna vulgaris 'Leslie Slinger'). ♤ Bud-flowering, mauve (H2); IX-XII; foliage summer green; new growth orange-red; habit upright, moderately vigorous. Deliberately raised seedling from unnamed bud-flowering seedling pollinated by 'Spring Torch', by David Wilson in 2005, selected in 2007. ® C.2010:05 registered by David Wilson, Chilliwack, British Columbia, Canada. Deep lilac-pink (H11) flowers, VIII–X, in long spikes; golden yellow foliage in summer turning rusty red in winter; upright; height 31–45cm; spread 46–60cm. ❁ White flowers, VIII–X; yellow foliage throughout the year; height 16–20cm; spread 31–45cm. Any reversion with green foliage should be removed as soon as possible. Sport on 'Alba Plena'; found by J. W. Sparkes at Beechwood Nursery (Beoley, Redditch, Worcestershire, England); introduced by J. W. Sparkes in 1951. Named after the raiser's mother.